Nowadays, life is very different for John Illsley. The former Dire Straits bassist lives in the New Forest, where he lives with his wife, their young family and two dogs. John it seems, has taken to country living. So much so, that when his local pub came up for sale, he decided to buy it, purely to safeguard its rustic charms. This is very different to what life was once like for John. At one time, John Illsley was a member of one of the most successful bands of the seventies, eighties and nineties,..Dire Straits. They released six studio album and three live albums between 1978 and 1995. These albums sold in excess of 100 million copies, and resulted in Dire Straits becoming one of the biggest bands. Sadly, nothing lasts forever. In 1995, Dire Straits quietly disbanded. By then, the only remaining original remembers were Mark Knopfler and John Illsley. Dire Straits’ swan-song was Live At The BBC on the 26th of June 1995. This meant that Dire Straits had fulfilled their contractual obligations to Vertigo. Not long after this, Mark Knopfler and John Illsley embarked upon solo careers. 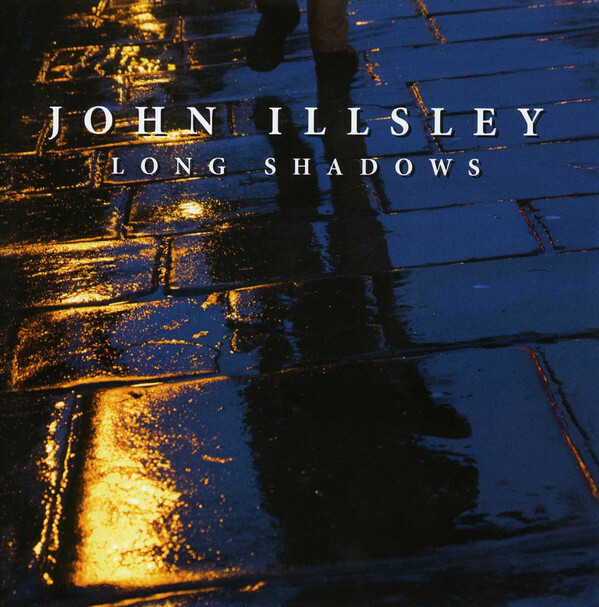 Now twenty-one years later, and John Illsley has just released his sixth solo album Long Shadows on Blue Barge Records. It’s the much-anticipated followup to John’s critically acclaimed 2014 album Testing The Water. For Long Shadows, John wrote the eight tracks on the album. These tracks were recorded at three studios, including Mark Knopfler’s British Grove Studios, Room Aith A View Studio and A Bay Studios. That was where John and a a few of his musical friends got to work. When work began, John’s core band was augmented by guest artists. This meant that the lineup changed from track to track. The rhythm section featured drummer and percussionist Paul Beavis, John on acoustic guitar, electric guitar, Fender bass and vocals and guitarists Phil Palmer and Simon Johnson who added slide guitar and mandolin. Robbie McIntosh aded slide guitar; Steve Smith grand piano, piano, Wurlitzer and Taurus bass pedal and Guy Fletcher switched between Hammond organ, electric piano and synths. Adding strings were violinists Everton Nelson and Ian Humphries; violist Bruce White and cellist Caroline Dale. The backing vocalists included Jess Greenfield, Dee Dee Illsley and Jess Illsley. Once the sessions were complete, Long Shadows was ready for release. Long Shadows opens with Let Me Inside (Or Let Me Out), a melancholy piano lead instrumental. A string quartet add a wistful hue, while John’s acoustic piano combines with the piano. Together, they create a truly beautiful, melancholy track. In The Darkness is a song that sonically, harks back to Dire Straits. A guitar shimmers, and chimes before the rhythm section lock into the tightest of grooves. Subtle, cooing harmonies sit atop the arrangement, before John’s worldweary vocal enters. He sings of how the internet can seduce people in various ways, including becoming radicalised. John’s lyrics are cinematic and cerebral; “he was searching for a reason, maybe looking for a reason, a desire to get involved.” Sadness fuels John’s vocal, as he ruefully delivers the lyrics. Soon, he’s singing: “as his fingers did the talking, to a faceless entity, with promises of endless pleasure and a route to ecstasy.” When the vocal drops out, the piano, rhythm section and searing guitar combine with cooing harmonies. Later, when John returns, he warns: “he’s on a road to hell,” and offers an alternative: “let the light shine through,” on this poignant, cinematic and cerebral song. As the rhythm section combines with guitars on Comes Around Again, again, sonically and stylistically there’s a nod to early Dire Straits. Even John’s vocal has a similar lived-in vocal quality to Mark Knopfler. There’s a sadness in John’s vocal as he sings of someone who: “left your family and your home…for this godforsaken place.” The arrangement is slow and understated as the rhythm section, crystalline guitars and harmonies combine. A slide guitar weeps, while acoustic guitars and a mandolin are added. Later, John cautions that:” you’ll always need a friend,” and offers hope that: “it’s not over till its over, it Comes Around Again.” As he does, John showcases his talents as a singer, songwriter, storyteller and musician. Washes of guitar reverberate, as if weeping on There’s Something About You. These guitars accompany John’s vocal, while subtle drums provide the heartbeat. Shivering cymbals add to the atmospheric arrangement; before an acoustic guitar is plucked and joins whispery harmonies. Later, the electric guitar shimmers, and adds to the slow, atmospheric backdrop to this needy, hopeful paean. The introduction to Ship Of Fools is almost dreamy. Just a glistening, shimmering guitar, rhythm section and subtle, distant washes of Hammond organ combine with an acoustic guitar. They usher in John’s lived-in vocal. Frustration fills his voice as he sings of the bankers who almost brought down the British banking system in 2008. They’re the: “monkeys who walked away Scot free.” All the government did was to: “invite them in for a cosy chat.” Now with nothing to stop this happening again, the: “Ship Of Fools goes round again.” Disbelief and frustration fills John’s voice. Meanwhile, the arrangement is understated and bluesy, as the rhythm section, chiming guitars, Hammond organ and harmonies accompany John. They play their part in another cerebral song full of social comment. Straight away, Lay Me Down reminds me of J.J. Cale. It’s a much more uptempo track, with the rhythm section driving the shuffling arrangement. Guitars and harmonies join the rhythm section. By then, John’s vocal is needy as he asks: “Lay Me Down under whispering trees, feel the warmth of the summer breeze, I think you understand, I wanna be your man.” As the arrangement becomes jaunty, chiming guitar licks and washes of Hammond organ join the harmonies. Then as a blistering guitar solo cuts through the arrangement, John and cooing harmonies combine, on this hopeful paean. It’s a fusion of Americana, blues, boogie, folk and soulful harmonies. There’s no drop in tempo on Long Shadows. Bristling, choppy guitars are to the fore, while the rhythm section and swirling Hammond organ power the arrangement along. John’s vocal is understated and lived-in, as he sings: to me you always made some sense, it was self-defence, you leave a Long Shadow, straight and narrow.” Meanwhile, his band create the tightest of grooves. The band never miss a beat, as they showcase their considerable skills. Especially as a blistering guitar solo is unleashed, and sits above the arrangement. Later, the story has begin to take shape and John is much more certain, and sings: “only game in town that’s making sense, it was self-defence.” With its cinematic sound and a mixture of mystery and intrigue, it’s a truly captivating track. Close To The Edge closes Long Shadow. There’s a drop in tempo, as briefly, the arrangement becomes atmospheric. Just the rhythm section and smoky Hammond organ combine before a bristling, chiming guitar is added. It’s the signal for John’s thoughtful, probing vocal as he sings: “you tried to climb a mountain, now you’re climbing walls instead.” Soon, John’s wondering if it’s worth the risks? “Getting Close To The Edge, hanging by a silver thread, is best to toe the line, or go where angel’s tread?” As he delivers the lyrics, the arrangement is rhythm section provide the heartbeat, while the Hammond organ and Wurlitzer join crystalline guitar. Later, John warns: “there’s a club the call heaven, where your credit card’s declined.” However, a rueful, John reflects: “you tried to climb a mountain, now you’re climbing walls instead.” John it seems, has kept one of the most poignant songs until last on Close To The Edge. Eighteen months after the release of Testing The Water, John Illsely returns Close To The Edge, one of his finest solo albums. The master storyteller works his way through eight songs that ebb and flow beautifully, as the listener is taken on a journey by John Illsley. From the beautiful, melancholy Morning, the songs on Long Shadows are variously atmospheric, beautiful, cerebral, cinematic and melancholy. They’re also captivating and full of mystery, intrigue and social comment. John also introduces the listener to a cast of characters on Close To The Edge, and proceeds to tell their story. Other songs are full of social comment. This includes In the Darkness, where John tells how people can be seduced by the internet. Then on Ship Of Fools, frustration fills John’s voice, as he remembers the bankers who took Britain to the brink in 2008, yet went unpunished. However, two of the finest songs are the paeans, There’s Something About You and Lay Me Down. John it seems is capable of switching between styles and tempo. That is the case throughout Long Shadows. John Illsley showcases John’s versatility, and his talent as a singer, songwriter, musician, producer and bandleader. Seamlessly, John combines elements of Americana, blues, boogie, country, folk and rock on Long Shadows. Sometimes, John and band sound not unlike Dire Straits. Then on Lay Me Down, John seems to draw inspiration from J.J. Cale. These musical genres and influences combine to create Long Shadows. which is without doubt, one of the best albums of John Illsley’s solo career. Long Shadows is also proof that, the old ones are the best. That there is no doubt about.